Mrs. Gladys Virginia Clark, 96, of Elkhart, Indiana went home to be with the Lord at 10:50 p.m., on Tuesday, February 12, 2019 at Elkhart Meadows, Elkhart, IN. 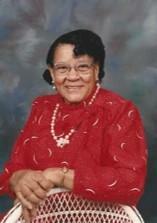 Gladys was born in Pocahontas, AR., to Sam Collier and Amy Taylor on August 25, 1922. She married Ester Lee Clark in 1941. Coming from Fort Meyers, FL., in 1968 she moved to Elkhart, IN. Gladys was preceded in death by her parents; Sam Collier and Amy Taylor , her husband; Ester Lee Clark, six brothers and four sisters. Gladys worked for the Red Cross & The Counsel of Aging for 15 years retiring in 1982. She was a member of Deliverance Temple Church of God in Christ where she served as Church Mother, former Sunday School Superintendent, Sunday School Teacher and former President of Prayer & Bible. Survivors left to cherish her memory include seven nieces; Melane Williams and Ivella Smith both of Chicago, IL., Hallie Owen, Cherry Williams, Annette Williams, Denise Johnson and Pamela Owen all of Madison, IL., six nephews; W.C. (Christine) Branch of Elkhart, IN., Eugene Williams, Jr., Clyde Owen, Clarence Williams, Robert Williams and Eugene Williams, II., all of Madison, IL. godson; Troix Williams and goddaughter; Cheralyn Gardnar both of Elkhart, IN., along with a host of other relatives and friends. Services will be held at 12:00 p.m., on Saturday, February 23, 2019 at Deliverance Temple Church of God in Christ with viewing from 11:00 a.m., to noon at the church.